In this stunning book, the traditional Christmas Story is brought to life by six exquisite pop-up scenes created by paper engineer, Robert Sabuda. We recently shared one of Sabuda's mini pop-up treats, Winter in White, in our round up of Winter books. Now we thought that Winter in White was pretty amazing but the paper engineering in The Christmas Story is on a whole other level. It is certainly the most spectacular pop-up book we have come across. At £25 it may seem an expensive book but in our opinion it is one that is worth every penny. If you don't believe us, just take a look at our photos below. This pop-up delight will certainly be enjoyed by our family year after year and we think it would make a very special addition to a Christmas Eve box or simply a beautiful Christmas gift to be treasured. 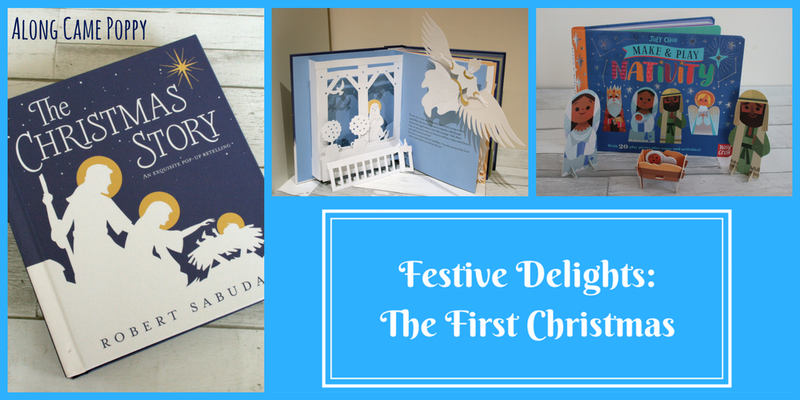 With this fabulous new activity book from Nosy Crow, children can create their very own 3D Nativity scene. The high quality spiral bound book includes 20 press out figures as well as a brief retelling of the Christmas Story, carols and craft ideas. The play figures are easy to put together and, although this is possibly a bit fiddly for younger children, it is a great activity to do as a family. The figures are incredibly cute thanks to Joey Chou's delightful style of illustration and are also nice and sturdy once assembled. The set includes Mary and Joseph, as well as three Kings, several shepherds, an angel, a whole host of animals and even Baby Jesus in his little manger! I can see us having hours of fun with this as Christmas approaches and the best thing is once the festive season is over we can press the figures back into the book ready for next year! We think both these books are ones to be treasured and we still have 17 festive recommendations to come. If you have a favourite Nativity story, please do let us know in the comments below. You can also share any festive recommendations on social media using #FestiveDelights - we always love to hear from you! *Disclaimer: Thank you to Nosy Crow and Walker Books for sending us these books for review purposes. All opinions are our own. Please note this post contains affiliate links, you can find out more here. The Make & Play Nativity looks good, but I can see why you love the pop-up so much, it's beautiful!